Visit https://www.theamazinggive.org/organizations/haven-hospice to participate in The Amazing Give! Haven strives to honor life by providing comfort, care and compassion to those we serve. One way we do this is through the Haven Make a Difference Fund. This fund is a means in which Haven can fulfill a patient wish to make a patient’s life by fulfilling a one time, meaningful, special request. One of our most recent stories is when the Make a Difference Team worked with the University of Florida (UF) Football Coach Dan Mullen and his assistant. Bobby Collins had been an incredible UF football fan his entire life and his family wanted to honor his love of the team. 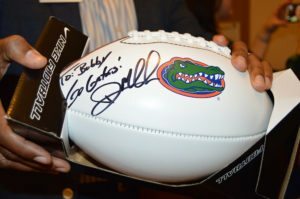 The Haven Make a Difference Team reached out to the Florida Gators to see what could be done and was able to acquire a football signed by Coach Dan Mullen, made out to Bobby. Another recent example is when a nurse discovered a patient’s air conditioning had broken in their home, but had no means to fix it. The Make a Difference Team was able to purchase an air conditioning unit for that patient. Haven was able to fulfill another patient wish by helping a patient move out of state to be closer to family by providing the needed oxygen tanks for the journey. At Haven, we believe that every day is a gift, hospice is about living, no one should suffer, and our staff and volunteers are the difference. Our Make a Difference Fund is another way in which we can honor the lives of our patients and brighten their days.